A headache is most often caused by a malfunction of the liver. If it is occasional, it is usually caused by overindulging. Some people get headaches in crowded places or in bright lights. 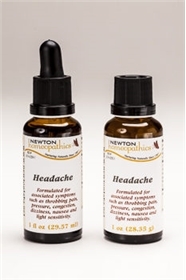 Use Headache for temporary relief of headaches and migraines caused by liver congestion, digestive problems, occasional hypertension, nervousness, fever, or constipation. Headache complex is also effective for caffeine headaches. DIRECTIONS: Take 3 to 6 drops on the tongue every hour until pain abates. For intense migraine take a dose every 15 minutes. INGREDIENTS: Arsenicum album, Belladonna, Bryonia alba, Cimicifuga racemosa (Actea racemosa), Coffea cruda, Crotalus horridus, Elaps corallinus, Gelsemium sempervirens, Lachesis mutus, Naja tripudians, Nux vomica, Phosphorus, Sanguinaria canadensis, Secale cornutum, Vipera berus 15x. Carduus benedictus, Convallaria majalis, Digitalis purpurea, Gaultheria procumbens, Salix alba 3x. Alcohol 20%.